Modern ingenuity blends with a symbol of ancient Japanese culture to produce the solar powered Japanese lucky cats we have discovered for you at Mrs. Lin's Kitchen. 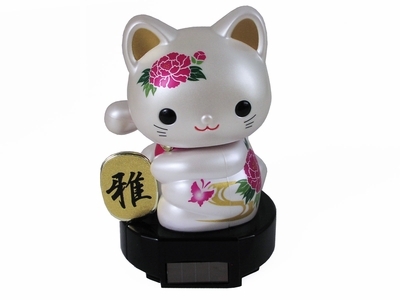 Also known as the maneki neko or beckoning cat, these solar powered versions of the traditional lucky cat adds the power of motion to bring luck your way. Available in both right paw and both paw versions, every little wish is covered, be it in your private or business life. The solar powered trio of lucky white maneki neko cats we have found is not only eye catching, but is sure to put a smile on your face as it slowly waves good fortune into your life with its outstretched paws. A gold maneki neko version we carry not only beckons good luck to its surroundings, the richness of its finish is matched by the gold coin held in one paw. Many of the maneki neko carry a gold coin in its paw that is called a koban and is also symbolic of the wealth that you wish to attract. Perfect as a gift for you to place on your desk or nightstand, these little moving versions of the Japanese good luck cats make a great gift for all ages and any occasion as well.